When I was a kid I loved Rubberband Guns. At the time they outshot Nerf toys and if you lost them they were and still are cheaper to replace than Nerf ammo. The problem is they were all made of wood and you only had a couple of choices. Now we have so many tools available and yet only a select few are making cool rubber band toys. In this article, I’m going to highlight a few of the toys I really liked, Along with a couple of my designs. My goal is to get more of you to make your own to share with the community. I wanted to start this article with the guy that deserves most of the credit for my first major rubber band build. Without his help, I wouldn’t have been able to create my SMG. Enough about me though. This guy makes some amazing rubber band guns and sells the blueprints as well as offers free plans. He’s an awesome guy please check his channel out. 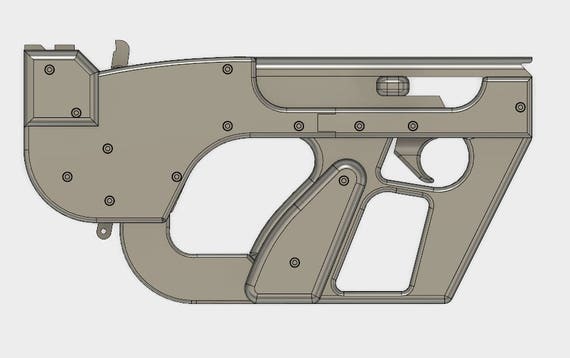 If you watch the video you will see where I got the plans to make the current version of my 3d printable SMG. Now you can make your own version out of wood but my prototype is free on Thingiverse now with the same basic plans he gives for free. You will still need to visit his channel to see how it’s assembled but I have modeled it all so you can print it, if you don’t want to cut it out of wood and plastic. For the time being this is the most firepower you’re going to have. That is until I’m done but that’s just a teaser. This design is awesome because it doesn’t use string or electric motors. It’s all printable and you can really throw a lot of bands at those office warriors. 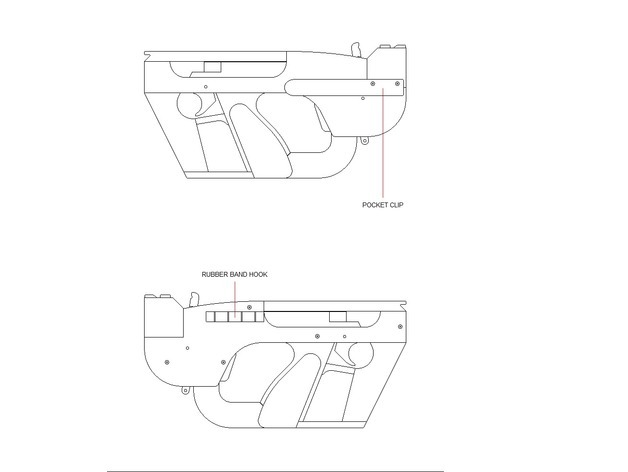 This design is simple to print and you can either go full auto or print the semi-auto trigger and plink away. I would make like 6 of these and pass them around the office. I really want to see more pistols that were more realistic. There are some talented designers out there. Let’s get some cool designs made guys. Not 3d printed but I wanted to share this none the less. Here is an opportunity for the 3d printing community. If you do a search you’re going to find lots of pistols but no rubber band rifles. Which is a shame because more people have large format printers these days and even so the models can be cut down to fit on smaller machines. It would be nice to get some long distance rubber band shooters. If you’d like me to take on the build let me know. If my SMG has enough interest I would happily model something like this. Lastly my version of the Space Stapler. I made this because there isn’t a lot of complex cool Rubber band guns out there to print or otherwise. After seeing parabellum1262’s design I knew it could easily be modeled and printed. So that’s what I did. The prototype is now for free just like his wooden version. The improved version is up in my Etsy store. Yes, I did contact him before I made anything and he was very cool with me making my version and selling it on Etsy. This version fixes some of the issues his original design had and improves the overall look of the toy making it a better candidate for a prop as well as a toy. This is a call out to the community. I want to see what you modelers can come up with. Let’s bring rubber bands back. With so many expensive Nerf toys out there, I’d like to see more kids and adults flinging office bands at each other again. Be it a copy or an original lets Flood places like Thingiverse with printable rubber band shooters. Maybe I’ll make a contest or something to win copies of my designs in the future if enough people are interested. Comment below, What would you like to see me or anyone else model to fling rubber bands with. I don’t like weapons toys, but I think the article is interesting. I remember back when I was a kid my friend’s granddad was a woodworker (carpenter for a living) and made him almost every toy known to man out of wood. He was a genius!! I remember he had a rubber band cannon that shot rocks. It looked like a Civil War cannon with the spoke wheels and everything! I would love to see what that man could’ve made with a 3D printer!! But me and David (his grandson) spent many hours playing war with rubber band guns and wooden swords and shields. The 3D printer seems to be all those woodworking tools all wrapped up in one machine, able to make anything a large carpenter shop can make. I would love to sit down and make some rubber band gun designs! How about a rubber band grenade!!!!!??? I’m not sure it could be done (hint hint Nathan..sounds like a challenge 😉 ) Some kind of timer inside that releases a switch holding 10+ rubber bands!! That would be awesome! You know a rubber band Grenade might not be that hard to make. I already have an Idea as to how it would work. Owow, I’d love to see what you come up with!! A rubber band grenade sounds like it would be awesome! Maybe a pressure sensitive switch so when the grenade hits the ground or makes an impact, the switch releases. As soon as i have some times i will try to print one! Impressive looking toy I know many people will have fun with. My father made a rubber band gun for me when I was a child but it was nothing like any of these! Totalily awesome. I’ve always wanted to try 3d printing. The Winchester it’s my favorite, old school gun enthusiasts like myself would find fun to play with this since the lever action actually works.